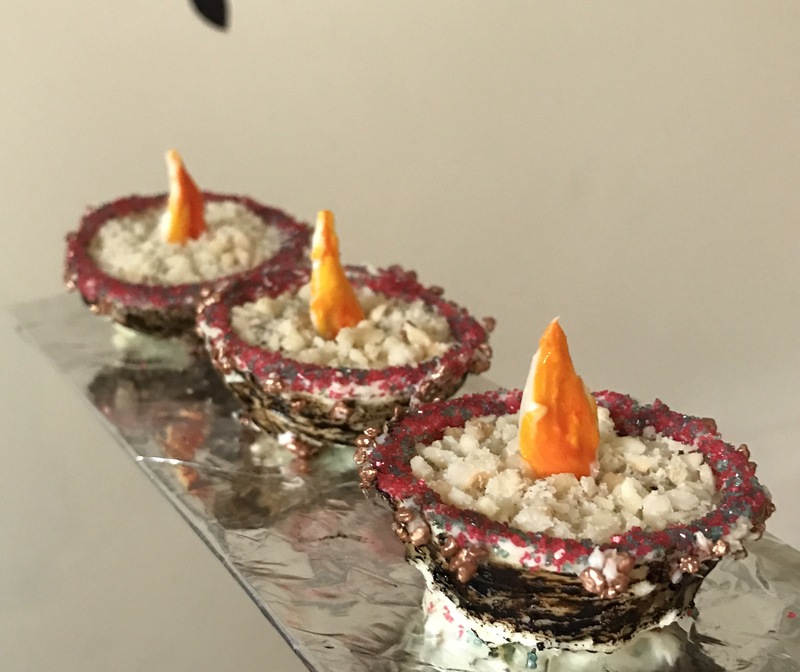 This Diwali I thought I would try an alternative sweet and I saw a you tube video on chocolate diyas/ candles. This is what they were meant to look like however as you can see from my photos they turned out the opposite. I haven’t done a clear step by step- this is because I got so frustrated they were not working as planned and in the process forgot to take pictures. Anyway the steps I followed were similar to the one on the you tube link above ..
1)Whilst melting the milk chocolate buttons add a couple of drops of orange essence. 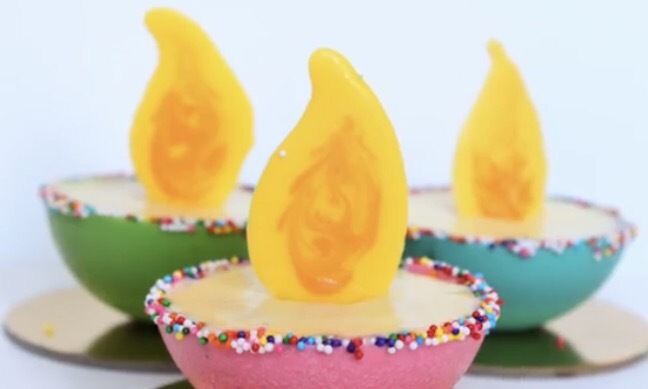 Melt the buttons in blocks of 30 seconds to ensure it doesn’t burn and is equally melted. Cover the outside of the silicone moulds with chocolate and put then in fridge to chill. I used cupcake ones but you can use any moulds. 2) Wait for 20 mins then slowly peel off the chocolate from the mould. Return the cups back in the fridge for five minutes just so they set a bit more. 3) In the meantime put a few hundreds and thousands in a shallow bowl or any dish with a flat service. I used red and green. 4) Prepare the flames. 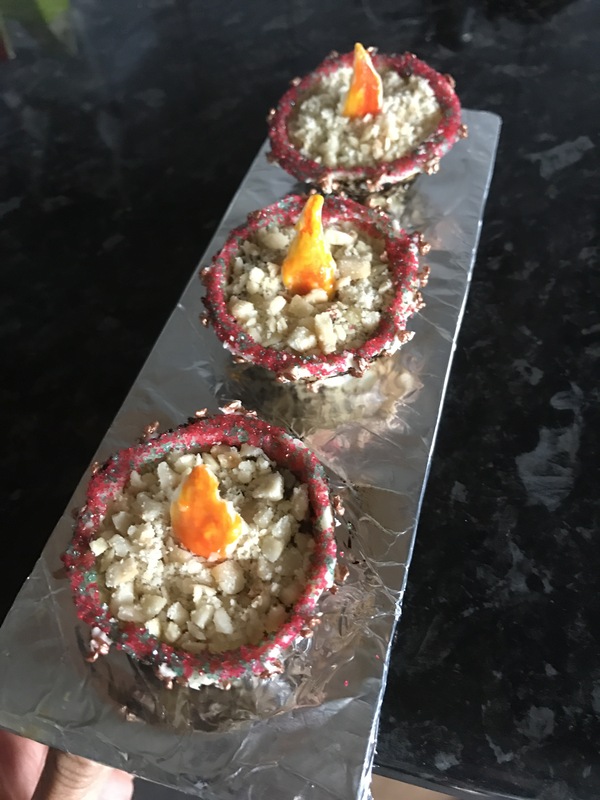 Get some greaseproof paper/ baking parchment and mould flames using a toothpick or a very small spoon onto it. They don’t have to be exactly the same. Put them in the fridge to chill. After five minutes take them out and dab/ paint colour onto them. (I started with putting a little blob of chocolate on the paper and moulding it upwards to form the tip. I then put the flames in the fridge to set. After five minute I took them out and dabbed colour onto them using the back of a spoon and toothpick. I started by putting the yellow all over then adding bits of orange with a brush.) This is only if you don’t have power or oil based colours that don’t mix with the whole chocolate. 5) Heat a frying pan – make sure it is not too hot. 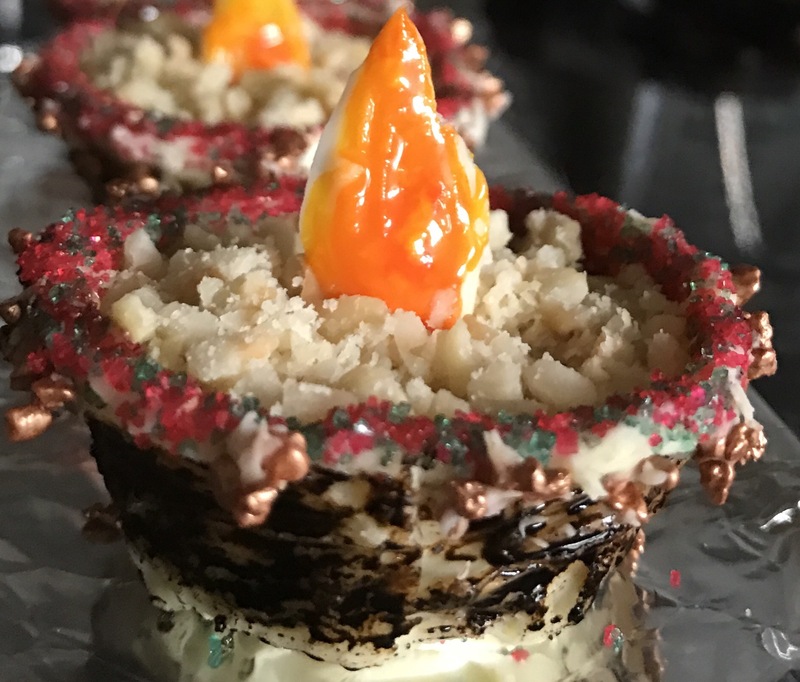 Get the chocolate cups out of the fridge, put the rim of each cup on the pan for a couple of seconds or until the chocolate just starts to melt and then dip the cup in hundreds and thousands so you get a colourful rim. Do this one at a time. Put the cups back in the fridge for 5 minutes. 6) Depending on the size of your cups you can have different fillings. 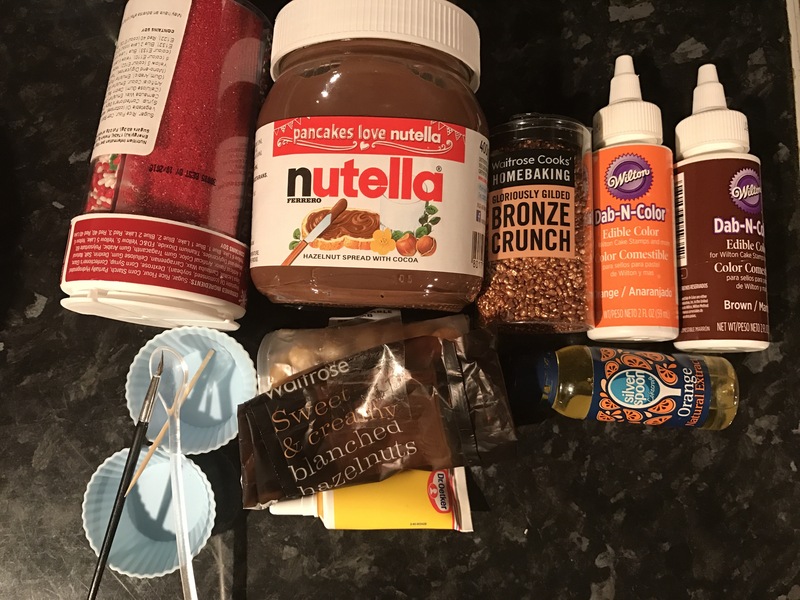 For small cups, start by putting a white chocolate button on bottom, then a teaspoon full of Nutella, one hazelnut and then a topping of crushed hazelnuts. 7) You can add a bit more detail to your divas. This could be little sugar pieces on the rim (I put bronze ones). Take a toothpick and dip it in some melted chocolate and put a tiny dot on the rim, then use the same toothpick to pick up some bronze sugar pieces and stick them on the place you made the dot. Follow this around the rim. Dab some colour using a brush ( I chose dark brown) on the outside of the cup to give it a rustic look- a bit like clay pots. 9)Put back the lovely treats in the fridge. Take them out about five minutes before serving or just as you are about to serve. If they are chilled you can see the layers inside when you cut through them. If they are slightly soft that is fine because they will just melt in your mouth.